Woot! A campsite with a net connection (and a cf reader). Day one - santiago airport to Portamarino, just south of Lugo. Lovely rolling roads folling the pilgrims trail (needed a MTB to follow on the trail). Weather went a little tropical on me, from 25 degree sunshine to tropical storms and hail all in one evening. There was a noise in my tent at 3am that kept waking me up, by 6am I had tracked it down - was a bleeding massive toad in my tent. My inner flap was open due to the heat! 50km mountain detour via Sarria, "because it sounded fun at the time", north from Sarria was very dull, but going east over the mountains was awsome (but lots of rain). Stupid map case gave out on me and got my maps sodden. I don´t think walking "waterproof" is the same as biking "waterproof" - the Orlieb pannier´s are very, very awsome tho, waterproof and visible! Lugo was a lunch stop, an ancient walled city (with a racing track one way system around the edge of the centre). Then it was time for a long treck through the mountains. Was mainly uneventful, apart from a boy racer trying to pick me up on an empty country road (I saw him in a hotel window in Ribberia, with a "friend" on his arm the next day) . Lovelñy down hill from a Potanova to the river, then a gentle ride into town in the evening. Lots of rain over the mountains. Long day, so didn´t manage to get any camping gaz. Cold bagged tuna and tomato for dinner! Decent (if expensive, 8 euro) campsite 3km west of Ribadeo. Day three - Ribadeo to Cadillaro. Has been nice and sunny today, even it threatened rain a couple of times. Hmm...landscape mode with 50mm lens on Camera doesn´t seem to be as clear as i´d like. Flickr is down again. it´s making a habit of this. google is too smart for it´s own good- how do I make maps show up in english?¿! I bet this is the last blog post I make, tis always the way with travel blogs. After three weeks hard slacking after Shortfuze it's time to hit the road. I've just decided where I'm going to uni the next logical step is a holiday - I've got a flight to Spain/Santiago for Friday [shivers] morning. Am generally heading for Copenhagen with the full intention of catching the train for a bit of journey if it looks like too much effort. If you clamp the breaks on, you just need the fly-sheet. no poles! It already exists. 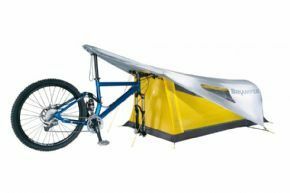 The Topeak Bikamper comes in at 1.6kg.